Where do I go to drop off my waste/recycling/yard waste items? We are located at 4550 Hwy 64 West, Conway, AR 72034 (map). Proceed West on Hwy 64, pass Hogan Lane on your left and Boone Loop Road on your right. Take the next right onto Cheryl Harrington Road. The Reuse Center and material recovery facility building will be on the left. Keep driving straight to cross the railroad tracks. Then, take an immediate right. You will see our scale house directly ahead, as well as our main office on the left. Drive onto the scale, and our employees will greet you. To ensure accurate rates, we will verify all addresses. Your government-issued I.D. is required and either your Conway Corp bill or the ready Conway Corp app (iPhone / Android). Applicable landfill fees are due on exit. Accepted forms of payment include cash and check only. The City of Conway recognizes some federal holidays. In doing so, offices and facilities are closed until the next regularly scheduled business day. This includes the Department of Sanitation's main office, landfill, recycling facility, and Reuse Center. Both commercial and residential collections will vary. Download our FREE Recycle Coach app (iPhone / Android) to stay up-to-date with holiday announcements and collection information. Where can I go to get the latest news and updates regarding my waste and recycling collection? Download our Recycle Coach app! Stay up-to-date with holiday schedules, frequently asked questions, and schedule changes. Download our app FREE for iPhone and Android. You can also follow us on Facebook @ConwaySanitation and Twitter @CwyARSanitation. Of course, conwayarkansas.gov/sanitation is always available with information on our services, hours, FAQs, and more. Do you recycle glass? Can I put glass in my recycle cart? Glass recycling bins are available to you at no cost. Glass CANNOT be placed in your recycling carts. Rinsed glass containers of all colors are accepted. Glass containers with labels and lids are acceptable. Light bulbs of any type are NOT accepted in the glass recycling program. What productions can be recycled in your program? Where can I take items that are still in good, working condition? Do you pick up bulk waste? We do not pick up bulk waste curbside. You may bring bulk waste items to the landfill only. Please note that some items will require a small fee for disposal. If you have a question about your bulk waste items, contact our office at 501-450-6155. Do you accept tires curbside? Do not place tires in your curbside recycling or garbage cart. Although we do not pick up tires curbside, Conway residents, who show ID and a current Conway Corp. bill, may bring up to four (4) passenger tires, off the rim, per month without a charge. There is a handling charge for anything over that limit or for oversized tires (e.g. tractor tires). Faulkner County residents may drop off tires, off the rim, for a nominal fee. 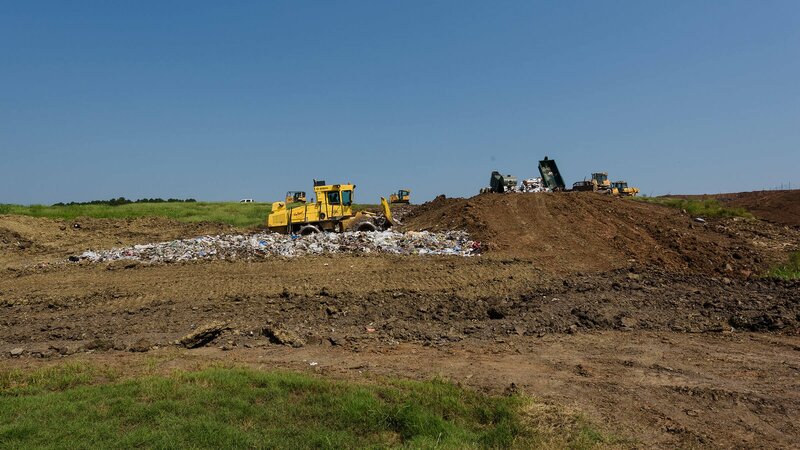 NOTE: Commercial tire dealers with large volumes should call our office (501-450-6155) before coming to the landfill to ensure there is sufficient room in the tire bin. My recycling/garbage pickup was missed. Why? Our employees work very hard to meet the waste collection expectations of every Conway resident/business, but every now and then, unforeseen events can occur (e.g. broken equipment and weather). If you are missed, contact our office at 501-450-6155. Our staff will investigate further and solve any issues regarding your waste/recycling pickup needs. Residential recycling and garbage carts must be placed curbside no later than 7:00 a.m. on the scheduled collection days. Business recycling and garbage carts must be placed curbside no late than 5:00 a.m. on the scheduled collection days. You must place carts on a flat surface at least three (3) feet away from all obstacles (e.g. other carts, utility poles, mail boxes, vehicles, sign post, etc.) and within two (2) feet of the curb, thus avoiding damage to the mechanical arm of our equipment and your property. Place cart so that the handle (and wheels) face away from the street. The lid must be closed completely. No garbage/recycling materials may be sticking out of the can. What should I do with my paint? Can I put my curbside garbage can? Residents (not commercial businesses) may dispose of small amounts of latex paint if it is dried to a solid (80% minimum) using kitty litter, sawdust or dirt-not sand; it should be capped, in its original container and labeled "solid." Pouring it on the ground can harm our streams, lakes or ground water; pouring it down the sink can be harmful and difficult to treat at the water treatment facility. It is best to use it up, dry it out, or donate to programs, such as Habitat for Humanity. Do you recycle florescent bulbs curbside? I need a roll off container or dumpster. Are these available? The Conway Department of Sanitation offers roll off container rentals and dumpsters to meet residential, business, and construction needs throughout the Conway city limits. Where can I take my electronic waste (e-waste)? The lead, mercury and many other elements in computers and other electronics, are very hazardous to our waterways and environment when disposed of improperly. Please do not put any e-waste items in your green or blue carts. All e-waste must be brought to our landfill. Every spring around the month of April, our Department partners with the Faulkner County Solid Waste Management District to host an FREE Electronic Waste Drive, where Faulkner County citizens can bring any e-waste item (must have a computerized, microchip, no appliances) to be recycled. I live outside the city limits of Conway, can I bring my recycling to your facility? Yes! We will accept any items that we actively recycle at our facility free of charge; however you must bring them to our facility if you live outside the city limits of Conway. What do I do with my household Medical Waste (e.g. used sharps/needles)? For safety reasons, residents who use medical waste products for in-home health care, need to take special care for everyone involved, including our employees. If possible, it is better to use a professional disposal system. If you currently have a doctor or home health care provider that accepts your used needles, bandages, IV bags, etc., please continue to use this means of disposal. Pour 1 part hypochlorite bleach and 10 parts water into the plastic container, let stand for 10 minutes, then drain into a sink or commode. Then securely close your plastic container. Place in your Green Trash can ONLY! PLEASE DO NOT PUT ANY MEDICAL WASTE IN YOUR RECYCLE BIN! Do you take Household Hazardous Waste (HHW)? No. We are a solid waste facility and not permitted to accept any liquids in our landfill (be it chemicals, paints, bodily fluids, etc.) Businesses with these types of products should first follow the proper disposal guidelines on the containers and follow procedures set up by their governing bodies. Although you are responsible for monitoring and keeping these materials out of the regular waste stream, our state governing and inspection agency (ADEQ) requires us to do random waste screenings of businesses due to the ban of certain materials, including bio-hazardous waste and liquids of any kind, from entering the landfill. Please contact our Landfill Manager at 733-5606 if you have any questions regarding this procedure. I have waste that requires special handling. Can the Department of Sanitation help me with the disposal? It depends on the type of material. If you have any materials that require special handling (e.g. contaminated dirt, asbestos, etc. ), please call our office at 501.450.6155 to make sure we can accept it and to make arrangements for disposal is applicable.